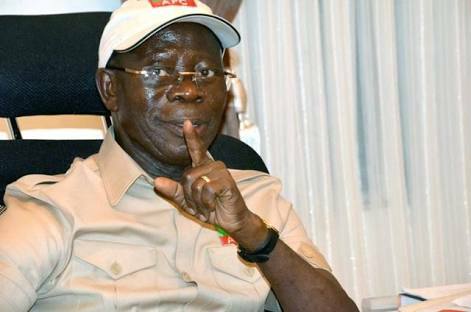 Amidst call for the arrest and prosecution of Adams Oshiomhole, the national chairman of the ruling APC, Nigeria's anti-graft agency, EFCC, has opened up on why they can't arrest the politician. EFCC challenged the jurisdiction of the Federal High Court in Abuja to compel it to arrest and prosecute Oshiomhole over allegation that he diverted public funds to his personal use. The anti-graft agency, which admitted that it was in receipt of petitions accusing Oshiomhole of complicity in acts of corruption, however, said it was not under any obligation to report or give account of its investigations to any individual or under a timeline within which to carry out its functions, about three years after the petition was submitted to the same EFCC. Specifically, the Applicant alleged that Oshiomhole who was sued as the 2nd Respondent, while in office as Edo state governor, acquired properties in United States of America, South Africa and Dubai worth billions of U.S. dollars and far in excess of his legitimate income. He maintained that EFCC’s refusal to act on petitions containing “weighty allegations” against Oshiomhole ran contrary to Section 15(5) of the 1999 Constitution (as amended) which enjoined the State to abolish corrupt practices. Vanguard reports that the EFCC, in a preliminary objection that was signed by its team of lawyers led by the Head of its Legal and Prosecutions Department, Mr. G.K. Latona, aside challenging the locus-standi of the Applicant to file the action, said it has discretion on how to use its available manpower to carry out investigations into petitions submitted to it. Does the discretion mean EFCC should focus on those outside the APC? EFCC told the court; "That investigation of cases is a holistic process which entails time, resources, inter-agency cooperation, interview of different persons and gathering of evidence over a long period of time depending on the nature of the case and other variables." In a written address attached in support of the objection, EFCC argued that granting an order for Oshiomhole’s arrest and prosecution as prayed for in the suit could occasion "chaos and tumult” in the polity. “We submit, with respect, that if this Honourable Court grants the reliefs of the Applicant, especially as it affects the 1st Respondent, that it will open a deluge of applications with the over-all aim of making the Applicant a stooge of litigant who desire to dictate to the 1st Respondent how, when, where and against whom the 1st Respondent should proceed in the discharge of its functions. The chaos and tumult that this scenario may generate in the pointy can only be Imagined. “We urge this Honourable Court to dismiss the Applicant’s application, same being unmeritorious and lacking in merit," EFCC added. The judge will rule on whether almost three years is not enough for EFCC to investigate Oshiomole and do the needful, especially when a former governor was arrested by the same EFCC just a day after leaving office.